Pipe Spring Fort (1870-1888) - A Mormon settler Fort established during the Ute Black Hawk War in 1870 near present-day Fredonia in Mohave County, Arizona. Sold by the Mormons in 1888. Also known as Fort Winsor Castle and Winsor Castle. Pipe Spring Fort Cheese Room showing all the Elements of Cheese Making at the Fort. Pipe Spring Fort East Cabin. Pipe Spring Fort West Cabin. Pipe Spring Entering the South Fort Building Cool Room. Pipe Spring Fort Cooling Rack in Cool Room. Pipe Spring Fort Dining Room. Pipe Spring Fort Telegraph Office. Pipe Spring Fort South Building Upper Level. Construction of the fort began first with the building of two single-story buildings to be used as living quarters while the main fort was being built. In the fall of 1869, a crew of thirty to forty men started to work on the fort. Two two-story buildings were built facing each other across a courtyard. The buildings were connected by walls with massive swinging doors, large enough for the passage of wagons. The fort was finished by 1870. The north building was erected directly over the spring, and the water was channeled through the south building, assuring a plentiful supply of good water at all times. 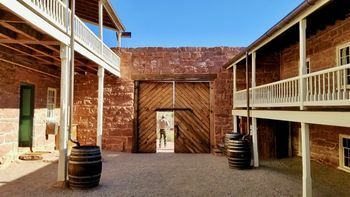 The Winsors used two rooms in the fort as a cheese factory and shipped most of the dairy products to St. George, Utah. Beef steers were driven to this point and in the spring and fall to St. George and Salt Lake City. Bishop Winsor moved to St. George in 1875, and the property was sold to private parties for use as a cattle ranch. The fort and auxiliary buildings were later acquired by the federal government. In May 1923 Pipe Spring National Monument was established. 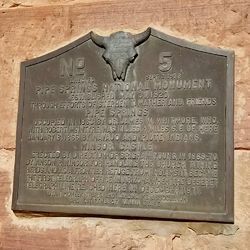 Pipe Spring National Monument Entrance Sign. Must See! Part of Pipe Spring National Monument. Four of the original buildings remain, fully restored and interpreted. 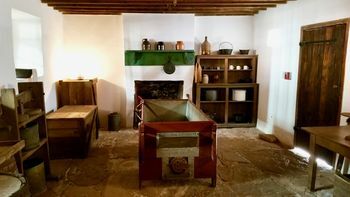 The interiors of the fort buildings have been furnished with period items that show the workings of the fort including the cheese production room, the spring-fed cooler room, the living areas, the kitchen, the dining area, the sleeping areas, and a replica telegraph office. The interior of the two fort buildings and the courtyard are shown by guided tour only to preserve the many period interpretive pieces. The 40 minute guided tour is conducted by an NPS guide who painted an excellent picture of life at the fort and the historical context. The tours operate every hour on the hour. There is also a museum and gift shop inside the visitor center. This is an out-of-the-way place but well worth the 60 mile trip from St. George, Utah. If you start early you can continue on to the North Rim of the Grand Canyon for another unforgettable experience. At the North Rim make sure to drive out to Cape Royal viewpoint and stop at all the other viewpoints along the way. Location: Pipe Spring National Monument, Mohave County, Arizona. Roberts, Robert B., Encyclopedia of Historic Forts: The Military, Pioneer, and Trading Posts of the United States, Macmillan, New York, 1988, 10th printing, ISBN 0-02-926880-X, page 50. This page was last modified 18:50, 7 January 2019 by John Stanton.